When one of art’s disciples and devotees is powered with wide intelligence, broad sympathies, quick perceptions, humor and common sense, loyalty and honor, only two things are lacking to insure success – capacity for hard work and a fair chance, meaning chiefly enough health and strength to make persevering industry possible. Everything else follows. 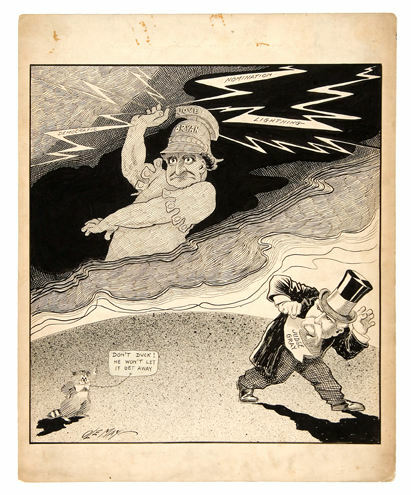 Ole May, cartoonist of the Cleveland Leader, is one of the living witnesses to the truth of this bit of moralizing. His record is the proof. And every day his work is making that record stronger as well as longer. He grows with his pictorial chronicle of the times. He “arrived” long ago, but he did not stop when he gained success. This versatile, many-sided newspaper worker is only thirty-nine years old, having been born in Pleasanton, Ia., June 24, 1873, but he has drawn pictures and written “copy” of many kinds in Los Angeles, Houston, Washington, Pittsburgh and Cleveland. As if that were not variety enough, he played four years in the Marine Band, at Washington; spent three years in Armour & Co.’s law department, at Chicago; was a court reporter two years in Colorado Springs and Denver; worked two years for a big coal company in Ohio, and served the Pullman Company in Chicago and St. Louis. as a newspaper artist he never wandered farther from that field than making pen drawings for a photolithographic concern in St. Louis and drawing pictures for an advertising agency in Chicago. The musical interlude in the Marine Band could hardly be counted a break with the newspapers, for during that period Ole did much art work for the Washington Post. It put him in line for his later positions on the Pittsburgh Gazette-Times and, finally, on the Cleveland Leader. So this gifted artist and humorist has touched life at many angles. He has watched the great human comedy in cities great and small, East, West, North and South. He is a votary of music and devotee of art, a trained writer as well as picture-maker. The breadth of his interests, like the range of his experiences, enriches his work in his favorite field. Such a man, full of temperament, quick to smile, instant in sympathy, keen in both mental and visual impressions, and vivid in speech, a lover of his fellow men, makes cartoons which come to the readers of the Leader like the morning sunshine. They have weight and “punch” in plenty, but they are pleasant to see, unless some terrible lesson has to be driven home. They appeal to humor, imagination, intelligence and common sense, and they get the answer they seek.